Protein is an essential nutrient needed for growth and repair, and for the manufacture of essential functional and structural components within the body, including the muscles. The amount of protein each person needs varies according to many factors, like age and condition. The body has a heightened need for protein during times of heavy activity, and most strength athletes fall under this category. Proteins are the building blocks of muscle, so laying down new muscle requires extra protein. While there is no established recommended daily intake for protein, many sports and nutrition bodies agree that levels of around 0.7-1g/kg bodyweight per day are appropriate for a sedentary person or recreational endurance athlete. According to The International Society of Sports Nutrition, people engaged in frequent high-intensity exercise require between 1.2-1.8g/kg bodyweight per day, and those involved in weight and resistance training should be aiming between 1.4 and 2.0g/kg bodyweight (1). How many Scoops of Protein Should I take? 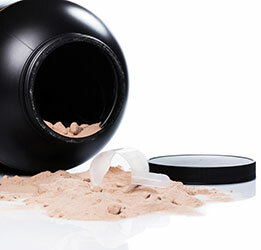 Protein powders are the easiest and most convenient way to supplement the dietary protein intake. There are many factors that may make it difficult to obtain sufficient protein from the diet. People with very high requirements may find it difficult to consume the recommended volume of food to supply their protein needs, as may also be the case for athletes following vegetarian diets. Ideally, the amount of supplementary protein should make up the shortfall in dietary sources. For example, according to the general guidelines outlined above, a 100kg male bodybuilder should aim to consume between 140 and 200g of protein per day. If he obtains 90g of protein through his diet, this means he has a shortfall of 50-110g of protein per day. If one scoop contains 25g of protein, he should aim to supplement his food intake with 2-4 scoops of protein per day. This is where it gets a bit more complicated. The body has a finite rate at which it is able to digest protein, which means that efficient protein supplementation requires a bit of planning. Different proteins are digested and absorbed at different rates. Research has shown that the fastest proteins, such as whey hydrolysate are absorbed at a rate of about 8-10g per hour, whereas slower proteins like cooked egg white are generally absorbed at a rate of less than 3g per hour (2). This is due to a number of factors, including physical digestibility, ease of absorption, and amino acid composition. While the digestive system can detect when large amounts of protein or a slower digesting protein has been eaten and slow down, compensating to give the protein longer to digest, it is generally accepted that there is an upper limit to the amount of protein that can be absorbed from one meal, and this is about 30g, although this figure differs between people (3). Any more, and there is a significant chance that the protein will pass through without being fully digested. Apart from the waste and inefficiency, undigested protein in the lower bowel may be consumed by microorganisms, which may lead to unpleasant symptoms. The best way to eat protein is to space out shakes and meals as much as possible to ensure maximum absorption. The amount of protein in a single scoop is usually close to 30g, so unless your protein drastically differs from this figure, one scoop per shake is a reasonable guideline to go by. How many Scoops of Protein Post Workout? After a workout is one of the best times to have a protein shake to replenish amino acids such as Glutamine, which is depleted during exercise, and to provide BCAAs – Leucine, Isoleucine and Valine – which stimulate muscle growth and assist recovery. A scoop of protein in milk or water is a great after-workout snack. How many Scoops of Protein Per Day? As we now know, the body has a finite rate at which it can absorb protein. Is there an upper limit to the amount of protein the body can handle? The answer is yes. In metabolising protein, the body generates ammonia, a toxic by-product which is usually metabolised in the liver to a harmless compound called urea, which is excreted in the urine. If this mechanism is overloaded, it is possible for ammonia to build up in the body and cause illness and organ damage. This can be serious and severe. For this reason, maintaining the protein intake within the prescribed range is strongly recommended (3). The total number of scoops per day will vary, and when calculating how many to take, it is important to remember to take the protein content of meals into account. Using our bodybuilder from above as an example, he might have three scoops of protein per day – one between breakfast and lunch, one between lunch and dinner, and a third after dinner. The required intake and ability to digest protein differs widely between people. While this article provides a guideline, it is up to each person to decide what works best for them.